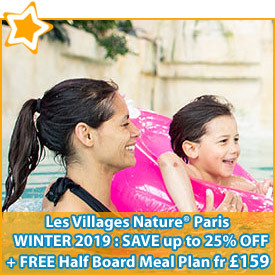 Whether you're 2 years old or 42 years old, Disneyland® Paris has something for everyone and furthermore, the Holiday Discount Centre is the perfect place to find cheap holidays to Disneyland® Paris. 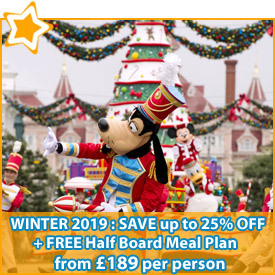 Our specialist agents have access to every promotion advertised by Disneyland® Paris with additional offers on travel by flights, Eurostar, ferry & Eurotunnel keeping that all important budget down so you can spend more whilst you are there! 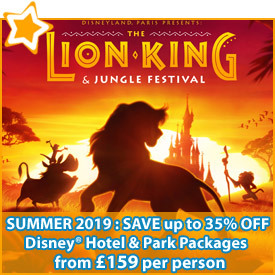 If you would rather arrange your own transport, our agents can arrange your Disney Hotel or a Disney Partner Hotel in the surrounding area at fantastic rates. The Disney agents are specially trained on Disneyland Paris having first-hand experience of Disneyland with top tips including arranging shuttle transfers plus special rates on private taxi transfers, advising you about any seasonal parties and extras such as ways of jumping to the front of the rides! 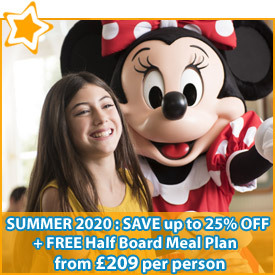 So don't waste a moment longer and call our Disneyland® Paris specialists to arrange one of their cheap Disneyland® Paris breaks. Disneyland® Park offers a huge range of attractions and fabulous parades for kids of all ages. Divided into 5 themed areas the park includes restaurants, shops and attractions from the exhilarating Space Mountain: Mission 2 to the wildest ride in the Wild West, Big Thunder Mountain. If you want to slow things down fly with Dumbo and Peter Pan in Fantasyland or gently cruise around the river of the far west on one of the elegant steam boats in Frontierland. Meet all your favourite Disneyland® Paris characters. Get a photo on main street USA with some of your favourite Disneyland®Paris characters. Then be taken "to infinity and beyond!" on Buzz Lightyear Lazer Blast (inspired by Disney-Pixar's Toy Story 2) in Discoveryland. Welcome to the Walt Disney Studios® Park... Where its lights! Camera! Magic! Everywhere! All the time! Step through the Studio gates and let your imagination soar. Time to immerse yourself in the never-ending, always fascinating world of movies, animation and television. Four production zones within the park featuring rides, shows and entertainment with one single focus; entertainment for the whole family. Choosing to stay at the resort can truly turn a weekend break into a magic experience. Thanks to the fact that there are hotels to suit every budget and taste - there is something for everyone. Each choice comes with its own magical experience. Within the seven onsite hotels, guests will find numerous restaurants ranging from buffet style food courts to formal table service. In addition each hotel has its own bar and gift shop. 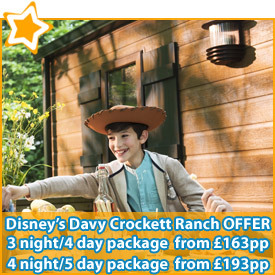 But whether you choose to stay in a wild west town or a rustic hunting lodge, a big apple skyscraper or a Mexican pueblo, you can be assured of one thing... Disneyland® Paris's outstanding quality and famous love for the magical details will make your trip a truly unforgettable one.